CocoanutApps, the developers behind the popular YouTube/YourTube HD jailbreak app and Gremlin jailbreak framework, are set to bring us yet another awesome jailbreak application called, “Celeste”. 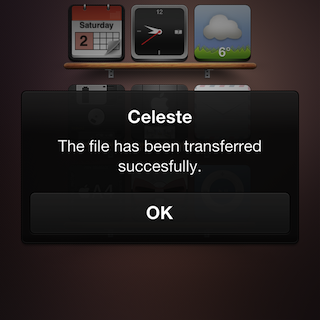 Celeste is a jailbreak app which will enable you to send or receive files and photos via Bluetooth File Transfer from your jailbroken iPhone 4, iPhone 3GS, iPhone 3G, iPod touch or iPad running iOS4 or later. 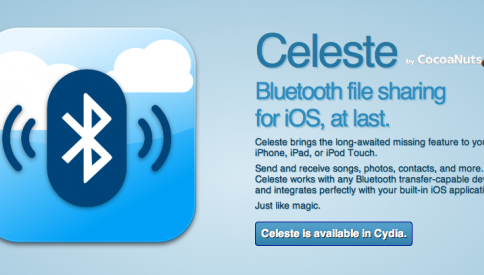 Celeste is the long awaited alternative to the iBluenova app, which only supported iOS 3.x. Cocoanuts has announced that the Celeste app is ready for release and should be available for download next week from the Cydia Store. So.. its been a while. You might be wondering what we’ve been up to over the past 6 months since we first showed that teaser screenshot of Celeste. Well, we’re happy to announce that Celeste is ready for release, we’re putting it through some extensive testing here at CocoaNuts “labs” and it’ll be up on the Cydia store sometime next week! We ran a contest on twitter yesterday to see if anyone could guess what kind of features we’ve been working on. We had 6 lucky winners who will get free copies of Celeste, so congrats to @Elagdar, @coolalien10, @Ntrenta, @NovaTornado, @TarekD_, and @iDarkman! We hinted at a secret we’d be announcing on our blog today, its one of the many breakthroughs we’ve made here at CocoaNuts as we’ve been working on the Celeste user experience. For the first time ever in the history of the iPhone, with the upcoming release of Gremlin, you will be able to sync downloaded songs and videos back to iTunes! And because Celeste comes with Gremlin for free, that means any songs and videos you receive over Bluetooth will act exactly as if you’d bought them from the iTunes store. We’re really excited about this! I find it very odd that Apple still hasn’t included Bluetooth File Transfer in the iPhone, a feature that my old Motorola V360 from 2005 has. Good thing we can always count on the jailbreak community!